The data are drawn from the Supplemental Security Record, the principal administrative data file for the SSI program. To avoid disclosure of the reason for individuals' eligibility, data on eligibility categories are suppressed for counties with fewer than 15 recipients or where all recipients are in the same category. 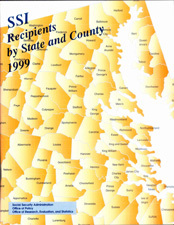 The amount of payments is not shown for counties with fewer than four recipients. Suppressed data are included in the state and national totals.